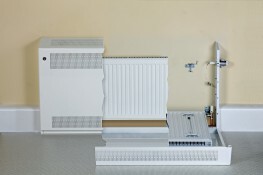 Contour Heating Products Ltd > News > Who Fits LST Radiators? On a traditional build project, M&E consultant engineers will have already specified what the design and size of the LST radiator will be to be when it’s installed. This ensures that you always get the best heat output for the space. Depending on the entry of the pipes and the flooring design, the casing may need to have cutouts in it to allow it to fit neatly over the top. •	Internal- inside the radiator cover. This is only recommended when the LST radiator is connected bottom bottom opposite end (BBOE). •	Remote sensing- inside the LST radiator cover. This is used when the radiator has been connected top bottom opposite end and the remote sensor can be installed at the bottom of the cover. •	External- outside of the radiator cover which enables the client to turn the radiator temperature up and down without needing to gain access to the radiator cover.